"Men qualify for freedom in exact proportion to their disposition to put moral chains on their own appetites. Society cannot exist unless a controlling power is put somewhere on will and appetite, and the less of it there is within, the more of it there must be without." 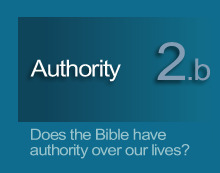 2.3 God the Father: the source of authority. God, or God the Father, is the source of divine authority by reason of his position over us in terms of power and perfection. Although the person of God the Father is not as clearly distinguished in the Old Testament as in the New (Deut. 32:6, Psa. 2:7, Isa. 9:6), three distinctions of his authority can be found in the above quotation of Isaiah; each accentuating God's superior position. In this passage, God is described as holding three different offices representing three unique positions of authority. Remember the former things, those of long ago; I am God, and there is no other; I am God, and there is none like me. (Isaiah 46:9 NIV). One God and Father of all, who is over all and through all and in all. (Eph. 4:6 NASB). Throughout the Bible, God is always presented as ruling with kingly authority. This chapter briefly describes the authority of God as Scripture applies it to God the Father.